the beneficiary of the policy is the same FNGT that owns the policy. The U.S. person of the first two paragraphs above, let us call him, Carl, is a beneficiary of the FNGT. Since the policy is issued from a non-953(d) company, the policy is not subject to the diversification requirements of 817(h), as well as the investor control regulations. If the policy is issued in Bermuda or Barbados, it qualifies as life insurance in the U.S. context, under section 101(a). At the passing of the last life in the policy, the death benefit flows income tax free, and estate tax free to Carl. A policy owned by a non-U.S. person or entity does not need to be U.S. tax compliant under 7702(a), but under 101(a) pays a tax-free death benefit to a U.S. beneficiary. 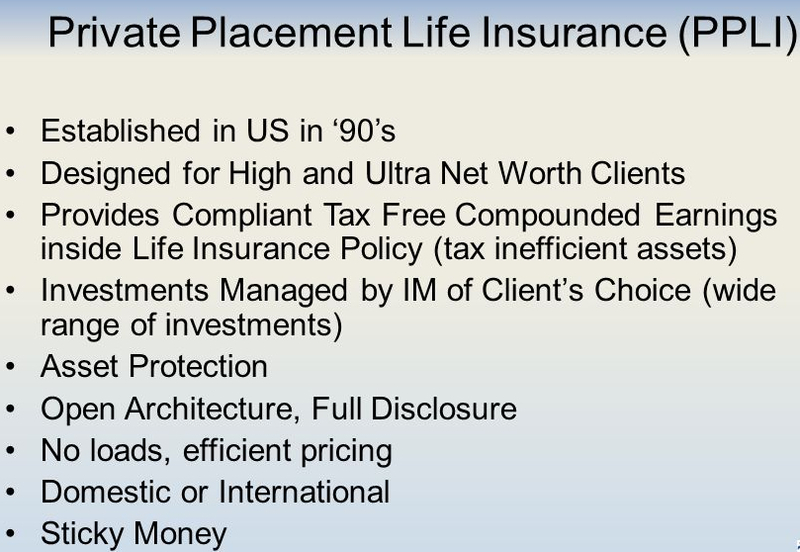 Being a non-953(d) policy, Carl is not subject to the investor control regulations, so can be named as an investment advisor by the life insurance company. This structure was developed for Carl, so he could borrow funds from the policy to make non-U.S. real estate investments, and still have the income and estate tax efficiency of using a PPLI policy. Using worldwide tax codes in the best interests of clients is at the heart of EWP. The proper study of worldwide tax codes is a gold mine that creates new road maps to give clients the most private and tax efficient structures possible, and still achieve transparency with tax authorities. Please give us a brief fact pattern, and we will be glad to structure a PPLI policy to meet your needs. This is our speciality. We are glad to share our years of structuring experience with you.